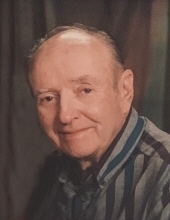 Clyde Broadway, age 92, of Golconda, Illinois passed away on January 12, 2019 at Hardin County General Hospital in Rosiclare, Illinois. He was born February 23, 1926 in Pope County, Illinois to Cecil and Rossma (Cummins) Broadway. He married Betty Zimmers January 7, 1950, she survives. He started his working career by hauling lime. Then Clyde worked with his father in a farm equipment business known as Broadway Equipment. He was a life long farmer. Clyde loved to read his bible. He is survived by his wife, of 69 years Betty Broadway; children, David and Denice Broadway, Glen and Cathy Broadway, Elaine and Mike Miller, Brian Broadway, Linda and Bill Burkhead, and Jason and Daysha Broadway; nine grandchildren, Ashley Hobson, Kristen Broadway, Daniel Broadway, Mike Broadway, Tori Armstrong, Brett Miller, Caitlin Miller, Erin McGrew, Diana Hanan; twelve great-grandchildren. He was preceded in death by his parents, and four siblings, Carl Broadway, Chloe Broadway, Faye Cossey, and Frances Trail. Funeral service will be 1:00 pm on Wednesday, January 16, 2019 at Aly Funeral Home in Eddyville, Illinois. The service will be conducted by Bro. Kevin Richerson. Burial will follow at the Prospect Cemetery. Visitation will be from 11:00 am until time of service on Wednesday at the funeral home. To send flowers or a remembrance gift to the family of Cecil Clyde Broadway, please visit our Tribute Store. "Email Address" would like to share the life celebration of Cecil Clyde Broadway. Click on the "link" to go to share a favorite memory or leave a condolence message for the family.